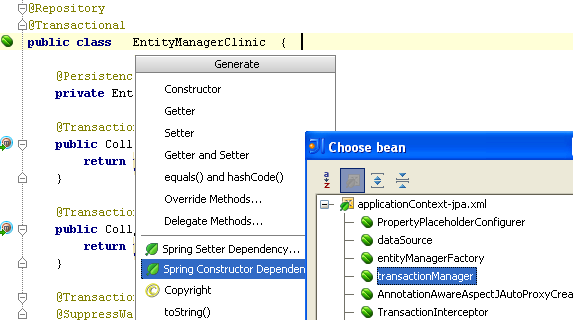 You can easily generate setter or constructor dependency to any Spring Bean from your application contexts. Just press Alt+Insert or select Generate from the Code menu, then select appropriate dependency type, and then select a bean. IntelliJ IDEA will correctly update your application context file and, if needed, invoke a Live Template to generate a proper constructor or setter method in your class file. This entry was posted in Tips & Tricks and tagged Code Generation, Live Templates, Spring. Bookmark the permalink.